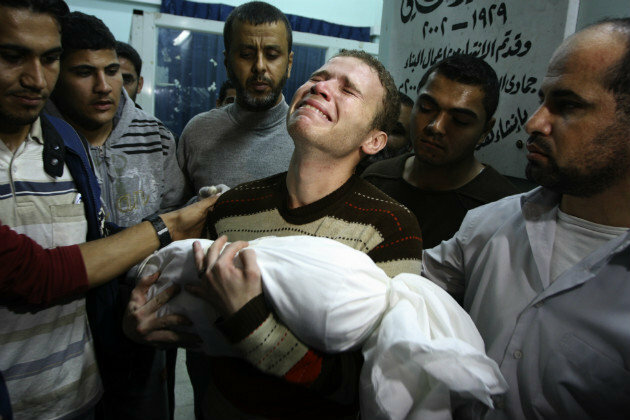 Home » World » Middle East » Israel Kills BBC Journalist’s 11-Month-Old Son!! Israel Kills BBC Journalist’s 11-Month-Old Son!! Israel’s senseless air-strike on crowded Gaza locations has now claimed the life a 11-month-old boy, who was the son of a BBC Arabic correspondent. The photo of Jihad Misharawi, BBC Arabic Correspondent carrying his son’s body and crying his heart-out is really very painful to watch. This photo was published on the front page of Thursday’s Washington Post. Misharawi’s sister-in-law was also killed in this attack. Misharawi’s brother is seriously wounded. They were all in their home when Israel bombed near their home killing them.